WWF Switzerland is the largest environmental and conservation organization in Switzerland. Organized as a charitable foundation, WWF Switzerland is based in Zurich and is part of the global WWF network, whose influence extends to around 1,300 conservation projects in over 100 countries around the world. One thing is common to all WWF projects: They should help stop the degradation of the planet’s natural environment and help build a future in which humans live in harmony with nature. Local volunteers across the globe are responsible for delivering on this mission by carrying out projects and excursions, and holding lectures and events. Of course, this requires funding—the majority of which is collected from donations. This was the challenge for WWF Switzerland. Even if most people recognize the panda as the symbol of the WWF, very few visitors to the WWF Switzerland website understood the benefits of supporting the WWF with their donations. The organization relies on these donations, so this had to change. WWF Switzerland’s intent was clear—they needed to improve site performance and optimize the conversion rate from homepage to their donation pages. 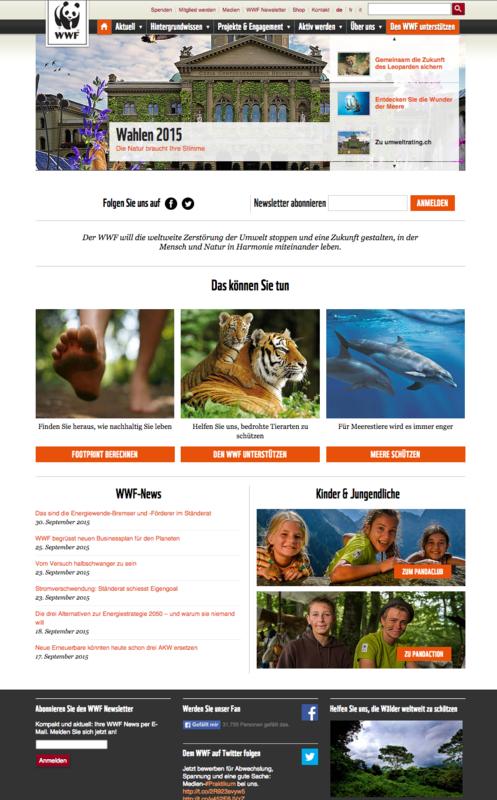 "First and foremost, we wanted to get more visitors from the homepage to the donation page," explained Yves Weibel, Web Channel Manager at WWF Switzerland. "In general, users should be able to quickly navigate to the pages that serve our main objectives." These pages include the main donation page, the award-winning WWF app download page, and the Footprint Calculator, which enables the user to calculate his/her individual ecological footprint with a quiz. The overall goal was to guiding more visitors to the donation pages and reduce the bounce rate. The upper section of the original WWF homepage included a slider with changing themes and calls to action. Almost the entire left column was consumed by the news ticker, which overlaid social-media updates from WWF, making it very text heavy. Next to this, on the right, was the campaign column, which showed specific examples of current or completed WWF campaigns. Where was the call to action for donations? This was on the far right under the tiger photo and thus not in a prominent, eye-catching position—a lost opportunity. 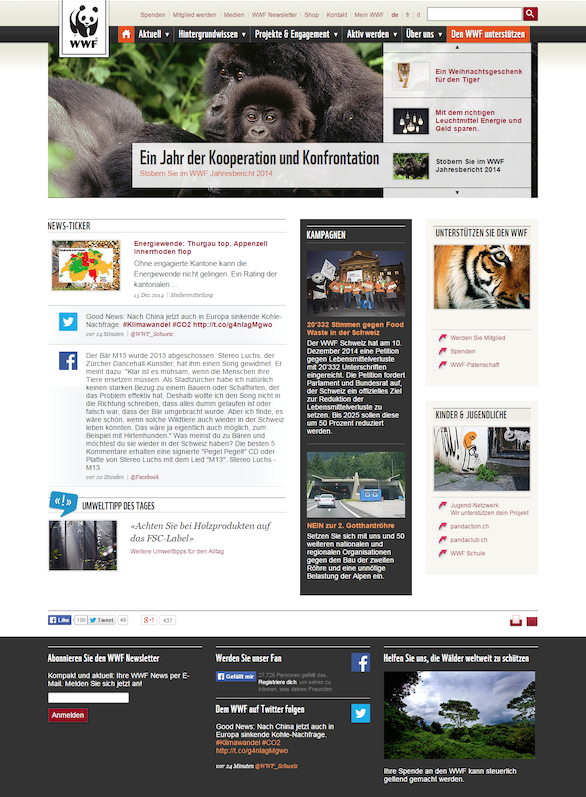 In order to increase donations through their website, WWF Switzerland relied on the services of Goldbach Interactive, an Optimizely certified solutions partner, who specialize in cross-channel, integrated online business concepts. "We have been working with Goldbach Interactive since 2013 in the fields of SEM and display," said Weibel. "Because of our strong relationship, it seemed like a good idea to work with them on conversion optimization." Goldbach Interactive tested the original version of the WWF homepage against several variants created using Optimizely. In addition, they used their custom reporting and analysis tool, TAO (track, analyze, optimize), to determine the effectiveness of each variant. "Our hypothesis was that visitors would more easily find their way around if we had a clear, user-centric design that would make them more aware of the opportunity to donate," explained Silvio Schneider, Head of Conversion Optimization at Goldbach Interactive Germany. The plan was to update the homepage, making it less crowded and bringing more attention to the most important elements. From a purely visual perspective, this was achieved. This is what the WWF Switzerland website looks like today. The new homepage looks "much tidier than the original variant; the content is not so squashed together," said Schneider. The header and slider remained unchanged, but the items beneath changed. The news ticker was designed to be more discreet, moving "WWF News" to the bottom left to provide space for the WWF mission to be moved to the foreground. Both the newsletter registration and references to social channels were repeated above. But most importantly, the call to support the WWF with donations is now positioned prominently featuring the tagline 'What you can do' to make it more personally impactful to the user. But what was the impact of the new homepage on conversions, especially to the donation pages? The results speak for themselves: through the optimization experiments and focus on a more intuitive user experience, the bounce rate decreased. The hypothesis previously put forward was confirmed: "over the 28 days of the project, we were able to bring 360% more homepage visitors to the important target pages, namely the donation page, the Footprint Calculator, and the advice app," said Schneider happily. "With a significance level of 99.8%, this means a clear and statistically valid increase in traffic to the donation page of this environmental organization." From the WWF’s standpoint, Weibel says "this is definitely THE highlight of the project – the 360% more clicks on our target pages – that's really great." And it will certainly make the panda happy. After the successful overhaul of the homepage, the WWF Switzerland would like to continue the optimization of its entire web presence. They will continue working with Goldbach Interactive thanks to the great results they achieved on the homepage and they hope to continue to increase donations that will help finance their future commitments to important environmental projects.